Ontario Clubs ,Jazz and Blues. Bosanova and Cha Cha, Size of dance floors are always questionable in these clubs as is the dance music. Toronto Waterfront Blues Festival, at Woodbine Park. Toronto Erie Music Festival, Nathan Phillips Square and Queen's Park. Brantford, International Jazz Festival, at the new Harmony Square in Brantford, Ontario. ALWAYS CONTACT THESE EVENTS BEFORE YOU VISIT THEM, AND PLEASE MENTION"DANCINGLIST.COM"
All Events subject to change, call before you visit. Always, Always call about the music before you visit the following locations. Please let Tony know if the music is continuously non-danceable at any of these clubs. And more important, let me know if there is or is not a dance floor or space to dance on. Jazz clubs usually have very little or very small dance floors, but are nice to take a dancing date out for an evening of cuddling. Live Bands play here. No dance Floor but will make room in front of bands playing. King St. Bowmanville, 905-623-6933, Saturdays, move tables for dancing. Live Entertainment on Fridays and Saturdays and some Wednesdays. Various Bands play Blues, Rock & Roll, etc. Call, will make room for dancers. Southern Comfort Jazz Club are here once per month. Blue Mountain Resort, Collingwood, 705-445-0231, Dance on a carpet in designated area. Based in Kitchener-Waterloo-Cambridge and Guelph. 729 King St. E. Kitchener, 519-743-0368, Open 7 days weekly, Dance area in front of stage ? Morden Road is one Block West of Dorval off Speers, Turn North on Morden..
.Arnolds is about a block up. . Dance Floor, 50s to 90s.music. FREE dance lessons on Wednesday nights at 7.30pm. Salsa, small dance area set up. 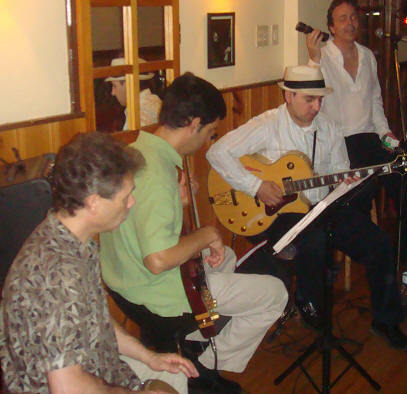 Several locations have jazz bands playing , some have dance floors or spaces and some do not. 25 Bellair, 416-944-2095, Will move tables for dancing if needed., No dance floor. Nice for an Evening out.Cozy,Clean,.Call. food was excellent and reasonably priced. Good band played There is a Dance floor. Tony Mergel plays here at times. Good Band. 500 Queen St. East, 416-368-6893, Swing Bands play here, No Dance Floor. 1875 Leslie, North York, 416-383-1200, On Sundays they allow dancing on the rugs in front of the band. ?? well ?? 379 Spadina, 416-977-7000, They do not have a dance floor, but people do dance in a room behind the band and around the tables on a wood floor. ??? 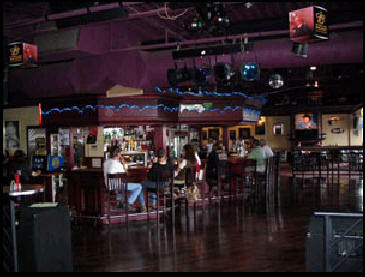 847 Browns Line, Etobicoke, 416-253-0037, Live bands on Frid,Sat & Sun, Dance floor. Always call & ask what music will be playing. Sometimes Live bands. One pc to 7 pcs. Small dancing area. Various Latins. 666 Burnamthorpe Rd, Etobicoke, Open 6 to 10pm. 21 Old Mill Rd. Toronto, 416-236-2641, Jazz Bands play here every Friday. 8.30 to 11.30pm. 472 Queen St. W. 416-646-6725, ??? 300 College, 416-920-0366 .They said ? they have a Dance Floor ? 10 couples to dance in front of the band. Wood Floor. 194 Queen St. W., 416-598-2475, Dancing in and arround tables and some small spaces available. Bands sometimes are excellent for dancing. NO Dance Floor. Only small space if not overcrowded. 120 Church St., Toronto, 416-947-9555, ???? 2335 Yonge Street, 416-487-7873, Various bands play here. 7 nights a week. Some very danceable. 2206 Bloor St. W., Toronto, 416-767-9222, Small Dance Area. 386 Kingston Rd., Toronto, 416-266-6920, Dance Space he says ?? 89 University Ae., W., Windsor, 519-977-6422 ??? (some are free with entry to dances) Tell them you saw it on Dancinglist.com, Please. Vanbuskirk Studio of Dance Ltd.,755 The Queensway S., Unit 103, Mississauga, 905-272-0409, Also Dansewear Sold at Studio.